New pay deal is on the table this morning as the GRA take out ads showing the plight of its members. 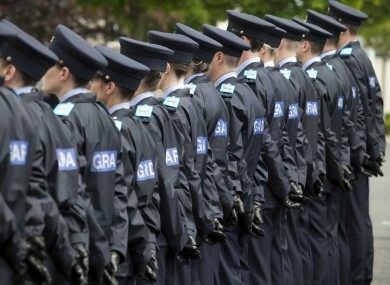 THE GARDA STRIKE was called off last night and after it was agreed to put a ballot to members. GRA president Ciarán O’Neill welcomed the improved offer saying one aspect which was especially welcome was that the pay increases would not be introduced on a phased basis but instead would be implemented straight away. A payment of €15 per annual leave day will be brought in from April worth between €490 and €510 a year. Gardaí will also be paid for what are known as pre-tour briefings, a 15 minute handover between shifts, worth €1,500 a year. Rent allowance will be restored to new recruits. O’Neill told Morning Ireland that the government was to blame for bringing the talks to the wire. He said: “It was a tight margin and down to the fact it was put down to the wire. One can only blame the government for not utilising state agencies. This notification for action came out on 28 September. While some media reports this morning claim the Government threatened that martial law would be implemented on the strike days, O’Neill would not confirm the specifics of what was said. However, he did say there were fears for the security of the State. Meanwhile, the GRA took out a full page ad in national newspapers showing a garda who was attacked in the line of duty. The ad was timed to coincide with the first day of historic garda strikes. It was intended to show what officers face every day and why they deserve the pay increases. Email “Garda strike: Here's the deal that's being offered to gardaí”. Feedback on “Garda strike: Here's the deal that's being offered to gardaí”.